Aspiring Comics Creators Find Guidance in “I Draw Comics” and San Diego’s Little Fish Comic Book Studio : COMICS ARE EVERYWHERE! 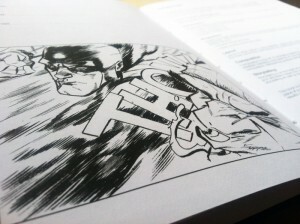 Would-be cartoonists can learn the ropes of drawing comics in the forthcoming book "I Draw Comics." 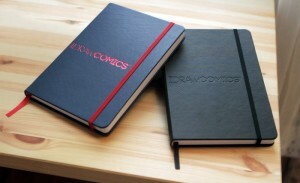 In terms of reference guides, you don’t need to look any further than the upcoming I Draw Comics book project that is generating a considerable buzz on Kickstarter. The project’s cool and fast-paced trailer clues you into what the book’s authors hope to accomplish with their project that includes templates for drawing the human figure and other “How-to” information relevant to aspiring cartoonists. If their book’s actual content matches their creators’ stylish flair for promotion expressed in the trailer, then readers are in for a valuable tool to jumpstart their goals of making their own comics from scratch. A page from the upcoming book "I Draw Comics." 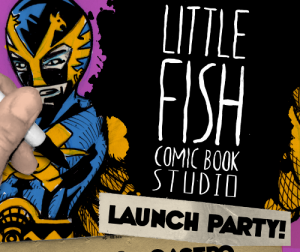 Closer to home, San Diego’s Little Fish Comic Book Studio had its launch party on August 30 and the artist-instructors Patrick Yurick and Alonso Nunez are gearing up to begin classes this fall. The small yet comfy, Ocean Beach-based studio space promises to be an engaging experiment in bringing an insider’s perspective to creating comics to students ages six and older. I look forward to seeing more of Little Fish Comic Book Studio’s founders Yurick and Nunez develop a new wave of aspiring cartoonists in the professional standards and practices of making comics. A colorful flyer for San Diego's Little Fish Comic Book Studio's recent launch party that happened over the 2012 Labor Day weekend. Peace out and break out that sketchbook, start drawing your heart out, and take the first step in transforming your dreams into a reality!